Deepa Byrappa’s two girls absolutely love jumping on the trampoline at Play Factory. It’s an ideal place to spend a few hours and let the children tire themselves out while having fun. They also have indoor cricket and volleyball facilities on turf, an outdoor beach facility, go racing, table tennis and a rope course. 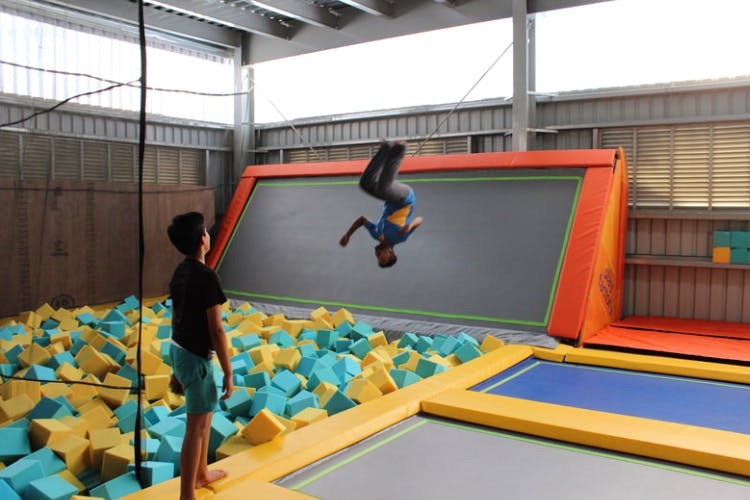 You can either chose to play with your children as it is enjoyable by all age groups, or you can leave the kids to jump their way around India’s first indoor trampoline park while you chill at the rest-o-bar. Ruth D’Souza swears by this place for her little girl. For children above 5, its fun that comes with learning. With fascinating shows for just about INR 30 for children, the children get to learn a lot about the solar system while getting to visualise it first hand. They also have science exhibitions where the children get to work, hands on, on science experiments. Twice every night, the show is displayed where the fountains surrounded by landscaped gardens are beautifully coordinated with lights and music. This makes for an appealing time for children who are fascinated by the grandeur of it all! Take them there one night and watch the sparkle in their eye, says Rahul Arun. Shamik Sen Gupta’s little girl absolutely enjoys climbing rocks at this fun place in Indiranagar. They offer walls with different difficulty levels for climbers. The minimum age for children to rock climb is five years, and it’s pretty safe too as the floor is layered with cushiony mattresses in case of a fall. Take your kids there and watch them pretend like their spiderman with their friends. Shamik says his experience there with his daughter was pleasant and enjoyable, despite her being under five. Just be super cautious, and teach them the ropes, literally. Located in Cubbon Park, the Bangalore Aquarium has on display a variety of ornamental as well as exotic fishes, and is extremely well maintained. Watch your child plaster their noses against the glass walls as they gawk at natural beauty. Ruth loves taking her child here too and believes that the aquarium is really underrated. A place for kids to enjoy, but subliminally hone their limb coordination, agility and flexibility, Rahul Arun swears by Funky Monkey. Especially if you have kids who never run out of energy. Giant soft blocks, foam rockers, bouncy balls and even a massive drum is a safe zone for toddles to tumble and roll about in, while the slightly older kids can experiment at the adventure that has ropes, tunnels and cargo nets. It gets the children to engage in activities that do not involve iPads and television screen. It also tires them out so they get some sound sleep, says Rahul, a huge plus point for parents too! This museum for children largely encourages experimental learning for children. But there’s more than just learning. They have a large play space for children of all ages where they can take part in hands on activities, and spend their day in mock airports pretending to be pilots, buy groceries from mock supermarkets and go mad at the toy store. There is also a cafe for the parents to hang out at while the children are having an meaningful, fun day. A unanimous vote from the parents we spoke to, this one’s quite the popular spot even for birthday parties, apparently.